1. 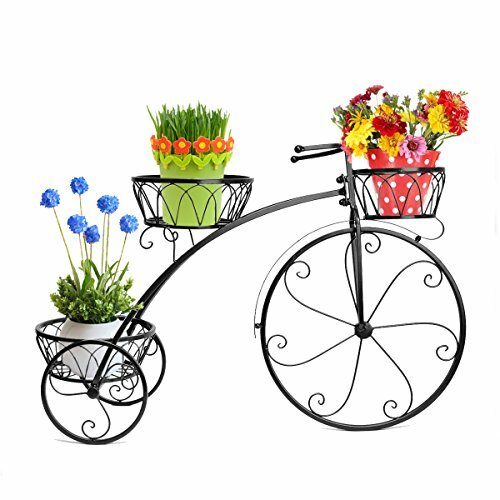 Add a touch of whimsy and dash of natural beauty to your home with this beautiful plant stand. 2. 3 round, basket-style tiers help you keep your planters safely and stylishly displayed. 3. When you're ready to bring bright, beautiful, and truly timeless style to any space inside or outside of your home, this flower pot holder is just what you need. With One Large Wheel in the Front and 2 Smaller Wheel in Back. Can be Used Indoor or Outside , Good For Real or Silk Plants, Very Nice Accent. Attached are Three Pails That are Ready to Hold Your Blooming Plants. **Official Dazone®product ** Plants not included. Free shipping from US.